Indian warplanes launched strikes on three militant camps that killed a "very large" number of fighters preparing an attack, in a move that worsens tensions with arch-rival Pakistan over disputed Kashmir, said media reports. 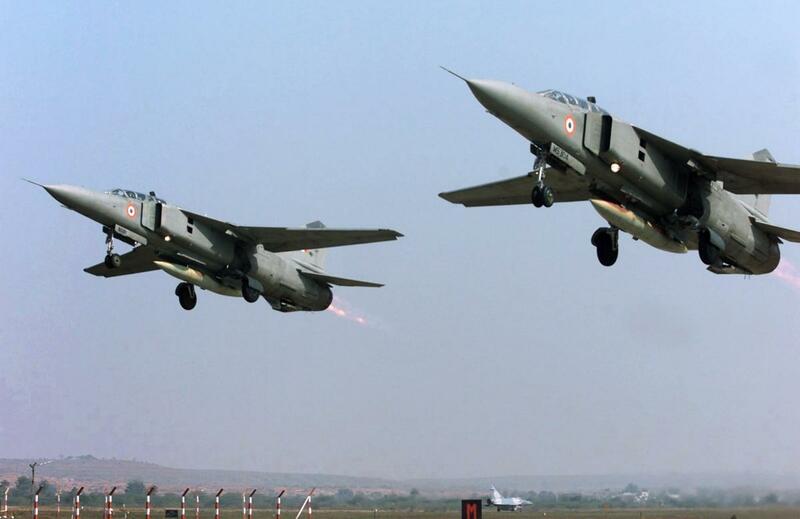 Pakistan's military earlier announced Indian jets had crossed into its airspace over the ceasefire line in the Himalayan region and dropped payloads, although it said there were no casualties. The escalation comes in the wake of a suicide bombing that killed dozens of troops in Indian Kashmir and sent tensions soaring. New Delhi had vowed retaliation after a Pakistan-based militant group claimed the attack. India's Foreign Secretary Vijay Gokhale said the raid was launched on a camp of Jaish-e-Mohammad (JeM) -- the group that claimed the Kashmir bombing -- because New Delhi believed suicide attacks in India were "imminent". "A very large number of Jaish-e-Mohammad terrorists, trainers, senior commanders and groups of jihadis who were being trained for fidayeen (suicide) action were eliminated," he told a media briefing. Pakistan's military spokesman Major General Asif Ghafoor tweeted that the Indian Air Force had violated the Line of Control, the de facto border between Indian- and Pakistani-administered Kashmir. Pakistan Air Force jets were scrambled in response to the incursion, he said. "Facing timely and effective response from Pakistan Air Force (the Indian aircraft) released payload in haste while escaping near Balakot. No casualties or damage." The Indian foreign secretary also said the camp was located in Balakot. There was confusion among analysts over the location as Balakot town is in Pakistan's northwestern Khyber-Pakhtunkhwa province, some 40 kilometres (25 miles) northeast of Muzaffarabad, the capital of Pakistani-administered Kashmir. A strike that deep in Pakistani territory, and not in a disputed region like Kashmir, would be a major escalation, analysts said. In a later tweet, however, the Pakistani spokesman said the incursion was "within AJ&K" - referring to the formal name of Pakistani Kashmir -- and just three to four miles over the LoC. Ghafoor did not clarify what he meant by "payload", which can refer either to bombs and missiles, or more generally to items carried which are not needed for the aircraft to fly. The military spokesman also tweeted images of what he said was the payload dropped by Indian planes, showing what appeared to be pieces of metal and displaced soil in a heavily forested area. Private Indian broadcaster CNN News 18 said: "Top government sources said that there were nearly 200 casualties from the (Indian Air Force) strike." No casualties have been reported in Pakistan. New Delhi had threatened to retaliate after the February 14 attack, the deadliest in three decades in Kashmir, killed more than 40 Indian paramilitaries. Top Indian government officials said that Tuesday's strike displayed the country's determination to act against Pakistan -- which New Delhi accuses of using militants as proxies against it. "They say they want India to bleed with a 1000 cuts. We say that each time you attack us, be certain we will get back at you, harder and stronger," said foreign affairs minister of state, Vijay Kumar Singh, a former head of the Indian army. Cabinet member Prakash Javadekar, the human resources minister, told journalists: "This is incredible. A necessary step for the country's security." Islamabad has said it had nothing to do with the latest bombing in Kashmir, and has warned it will retaliate if attacked by India. Pakistani military analyst Hasan Askari called Tuesday's incursion a "dangerous move". "If such actions continue, it can escalate into major conflict, which will not serve any purpose but to plunge the region into serious crisis," he said.